As some of you know, I'm a big fan of the Educause "7 Things You Should Know About..." series. This is a link every educator integrating web-based technologies should have on their radar and share with everyone in their professional networks. Ironically, today I received an RSS update from Educause noting their most recent addition to the "7 Things" library which showcases the topic of my last two posts "Next Generation Presentation Tools." 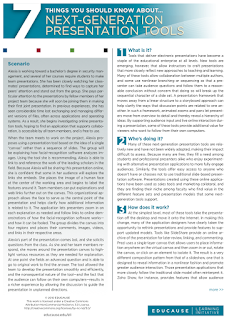 If you've enjoyed the posts "So Long Powerpoint, Hello Prezi" and "Zooming into the Future of Visual Learning" then you'll certainly enjoy the well done Educause abstract which includes an excellent scenario describing why and how a student in a face-to-face class could benefit from the innovative features of the Prezi interface. Also see my June 26, 2009 post discussing the "7 Things You Should Know About VoiceThread" resource.